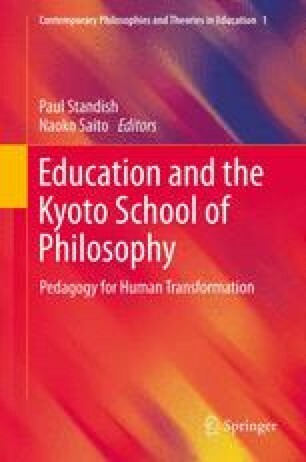 Cross-cultural dialogue between the Kyoto School of modern Japanese philosophy and the classical pragmatist tradition in American philosophy can help educators to clarify aims for greater ecological responsiveness in moral education. This dialogue can contribute to meeting an urgent practical need to cultivate ecological imagination, and an equally practical need to make theoretical sense of the way in which ecological perception becomes relevant to moral deliberation. The first section of this chapter explores relational thinking in the Kyoto School and American pragmatism to help develop, in the second section, a concept of ecological imagination. A fine-tuned ecological imagination is a capacity we already count on in our best environmental writers, educators, scientists, and policy analysts. Moral deliberation enlists imagination of a specifically ecological sort when the imaginative structures we use to understand ecosystemic relationships shape our mental simulations and what John Dewey calls our “dramatic rehearsals.” The final section draws from the foregoing to clarify some appropriate aims for contemporary moral education. Enriched through cross-cultural dialogue about the relational networks in which our finite lives are embedded, a finely aware ecological imagination can make the deliberations of the coming generation more trustworthy. This research was supported in part by a Fulbright lecturing-research grant which allowed me to teach and conduct research at Kyoto University and Kobe University from March through August 2009. I am grateful to David Satterwhite, Mizuho Iwata, and their colleagues at the Japan-United States Educational Commission in Tokyo for their generous support. James Heisig at the Nanzan Institute for Religion and Culture generously hosted a brief yet productive visit to Nagoya. I am also grateful to Tomida Yasuhiko (Kyoto University), Kazashi Nobuo (Kobe University), Abe Hiroshi (Kyoto University), Carl Becker (Kyoto University), and many others for their unfailing support and friendship. Any scholarly errors in this chapter are of course entirely my own. All references to Dewey are to 1969–1991. The Collected Works of John Dewey, ed. Jo Ann Boydston, 37 vols. Carbondale: Southern Illinois University Press. Citations are to EW, MW, or LW (Early Works, Middle Works, or Later Works), followed by volume number, followed by page number. Carter, R. (2004). Watsuji Tetsuro. In Stanford encyclopedia of philosophy. http://plato.stanford.edu/entries/watsuji-tetsuro/. Accessed 1 July 2007.